Custom Metal Tags - Stainless Steel, Aluminum, Valve, Brass, Blank, Embossed, Aluminum Foil Write On & Many More | BB Tees Inc.
BB Tees, Inc. supplies a large variety of custom metal tags, including Stainless Steel tags, Aluminum & Anodized Color Aluminum tags, Brass, Blank, Stamped, Laser Etched and Embossed tags; Valve tags, ID Tags, Utility Pole tags, Aluminum Foil Write On tags (Debossed), Serial Numbered tags, Asset tags, Dog Tags, License Plates and many more. Plastic tags also available. 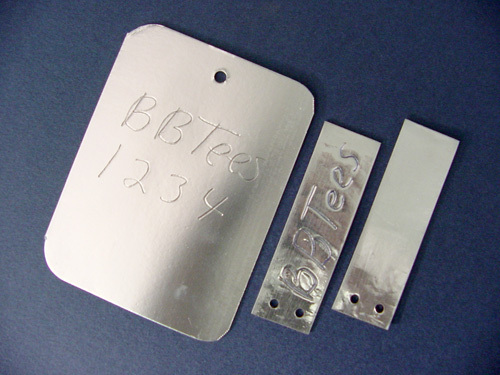 Flat metal blank tags for use in embossing machines are available in a CR 50 and CR 80 size with 1 or 2 holes available. Other metal tags from .016 - .060 are available in many shapes and sizes in aluminum, anodized color aluminum, stainless steel, brass and steel. These tags are ideal for stamping , engraving, laser etching and embossing. 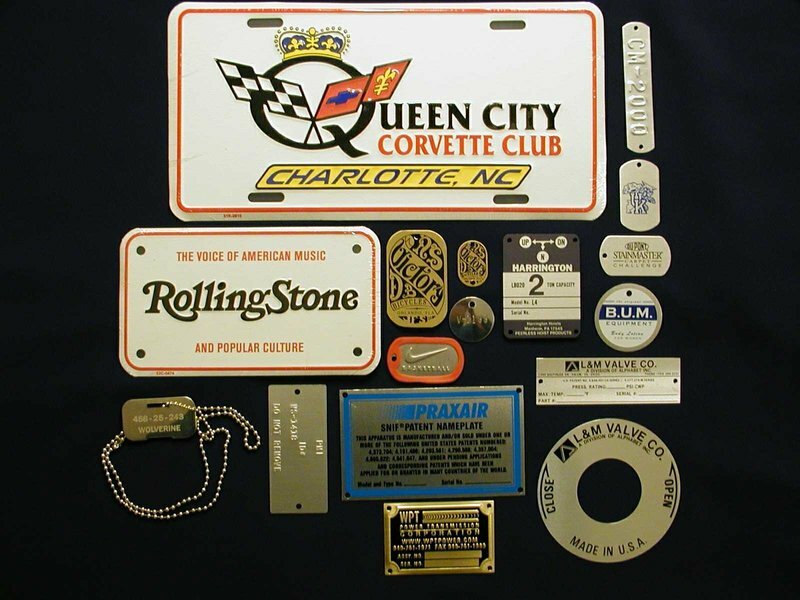 Some other types of tags available are GI dog tags, pet, key, utility pole, asset, ID, medical alert, plastic and more. Shapes include round, square, rectangle and oval. Custom shapes also available. to medium requirements as well as variable information on each plate. 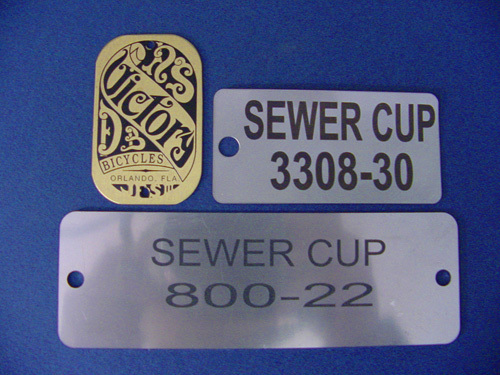 Valve tags are supplied in stainless steel, aluminum, anodized colored aluminum, brass. Stainless steel is best suited for very harsh and corrosive environments to prevent the parts from rusting. 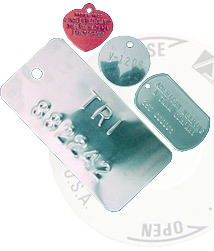 Valve tags are marked by stamping, laser etching, engraving or embossing for permanent marking of letters and numbers. Aluminum Foil Write-on Tags can be debossed with a pen on one or 2 sides. The tags are made of dead soft aluminum foil wrapped around a cardboard core. The tags are weather resistant and can be used outdoors or indoors. Many uses include Product Identification, plants & trees, inventory control and part numbering. Galvanized tag wires are available for attaching the tags to parts. The tags and wires are sold per thousand. The wires are available in 7½”and 12” lengths. Tag sizes available are 7/8 x 3” and 3 x 4” and 3 x 5”. Aluminum, .024 x 6” x 12”, 4 slots , round corners , raised borders , custom embossed logo’s and copy from 1 color to 4 color process.